I have decided to end the Peterite Blog. It has run for just under four years, some 198,000 of you have visited (over 600 yesterday), which is a goodish score for what never purported to be other than a parish diary online. I can see little future for a blog of this sort and thus it is a kindness to you all to end it. It’s the end of a parish blog, and the end of a parish, and really the end of a way of life too. Reading the blog about the parish took me back fifty years, because that was what the Anglican Church was like in Johannesburg fifty years ago. St Peter’s, London Docks, must be one of the last surviving pockets of a kind of Christianity that was quite widespread and influential in the 1920s, but went into a serious decline after 1960. Such sights used to be common in Anglican Churches in Johannesburg, and often involved priests from the Community of the Resurrection, the religious order to which Father Trevor Huddleston belonged. I never met Father Huddleston, but I read his book Naught for your comfort , which I recently reread. I also knew several of his colleagues in the Community of the Resurrection. The Community of the Resurrection also trained many of the black Anglican clergy at St Peter’s College in Rosettenville, next to their priory, and just across the road from St Benedict’s Retreat house, run by the sisters of the Order of the Holy Paraclete (OHP). All gone now. St Peter’s College was forced by the Group Areas Act to relocate to Alice in the Eastern Cape in 1963, where it joined other denominations in the Federal Seminary, which was in turn kicked out of Alice ten years later. The clergy who trained at St Peter’s, Rosettenville have probably all retired by now. One whom I met when he was a student there was Desmond Tutu who introduced himself as the man with the name like a motorbike (isithuthuthu in Zulu). He was one of the last. St Benedict’s was a place where many parishes in Johannesburg went for retreats, and also met for Shoe Parties, monthly gatherings where speakers would speak on various aspects of the Christian faith. The High Church ritual, with vestments, incense and birettas, went together with the kind of social activist Christianity represented by Naught for your comfort — a Christianity based on the theology of the Incarnation, and a high view of the church that regarded attempts by the government to separate by race people whom God had united in baptism as tantamount to blasphemy. 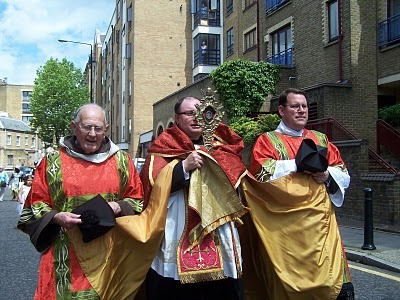 That kind of Anglo-Catholicism had been nurtured in parishes like St Peters in Docklands, which in the 1920s and the 1930s were run-down slums, and Anglo-Catholic priests, many of whom had grown up in the relative comfort of upper-middle-class homes went to those parishes and worked among the poor. Many of that school found their way into the Community of the Resurrection, and exercised the preferential option for the poor. Not all the CR fathers and brothers were as overtly “political” as Father Trevor Huddleston, but they were usually less vocal about it, that was all. Another in the same mould was Arthur Shearly Cripps, who lived an ascetic life in Zimbabwe, then called Rhodesia. The Anglo-Catholic movement developed in England in the second half of the nineteenth century. It combined the High Church theology of the Tractarians with ritualism, which was unacceptable to many “Low Church” Anglicans at the time, so that the early Anglo-Catholics were often persecuted. The Ritualists followed many contemporary Roman Catholic practices, and indeed elaborated them. They believed that they taught The Catholic Faith, and had a strong sense of historical continuity of the church. In England, where the Church of England was the Established Church, many saw it as a religious arm of the State. But the High Churchmen had a higher view of the church than this. They saw it as founded by God, not man, and built on the foundation of the apostles and prophets, rather than kings and prime ministers, and this was guaranteed by the apostolic succession of its bishops. When the Bishop of Cape Town tried the Bishop of Natal for heresy, Anglo-Catholics in England saw him as contending for “the faith once delivered to the saints” and many of them came to South Africa to work. And, like their colleagues in England, they tended to work among the urban poor, who in South Africa were mostly black and coloured. So parishes in the black townships, especially in the Witwatersrand, were often marked by the kind of processions seen at St Peter’s in Dockland. I went from an atheist/agnostic upbringing to a Methodist school with Protestant teachers who converted me to an evangelical “born-again” kind of Christianity, teaching the importance of personal commitment to Christ. When I left school, however, I was plunged into the Anglo-Catholicism of the Anglican Diocese of Johannesburg. In my parish, St Augustine’s, Orange Grove, we had High Mass with all the trimmings twice a year, at Christmas and Easter, and on ordinary Sundays there was Low Mass at 7:00 am and Sung Mass at 8:00. But when we visited parishes in Alexandra or Orlando or Meadowlands, or St Cyprian’s in downtown Johannesburg, there were 20-30 red-cassocked altar boys, and clouds of incense produced by thurifers who were amazingly dextrous and manipulated the censer like a drum majorette tossing a baton. It was in such parishes that political activists like Oliver and Adelaide Tambo grew up. In England the Anglo-Catholics lived side by side with the Low Church Evangelicals, and the Broad Church modernists, who are now called “liberals”. As it was said in those days, the three main parties among Anglicans were the Low and lazy, the Broad and Hazy, and the High and crazy. In Johannesburg, however, the Low Church were in a separate denomination, the Church of England in South Africa (CESA), which, perhaps to distance themselves even further from the Anglo-Catholics, became staunch supporters of the National Party’s policy of apartheid, and, among English-speaking white South Africans at least, constituted the “religious right” of those days. Several of their leaders attended and spoke at the far-right Volkskongress Teen Kommunisme (People’s Congress against Communism) in 1964, which denounced liberalism along with communism and racial mixing. But after about 1960, Anglo-Catholicism began to decline, and by the end of the 20th century it survived in only a few isolated pockets, like St Peter’s in Docklands. In 1966 I went to England to study at St Chad’s College in Durham, which was reputedly a High Church college, and there I encountered an entirely different brand of High Churchmanship, and one that in my mind was associated with the 17th century. There were several High Church Tories in the college, and, in marked contrast to the heroic priests of the London slums who took the preferential option for the poor, these took the preferential option for the rich and aristocratic. This new and effete version of Anglo-Catholicism I had never enountered before. Some of the new students at the college went to tea with the principal — I was from South Africa, and another from New Zealand, and the third was one of these High Church Tories. Whenever anything was mentioned that was inefficient or nutty about the church, he applauded it loudly. He appeared to think that New Zealand was still a crown colony, and the idea that New Zealanders no longer thought of England as “home” horrified him. He acclaimed the startling (to me) and radical revelation that the Bishop of Durham lived at Bishop Auckland, andthe Bishop of Jarrow lived in Durham. He was, of course, an arch-Tory, probably was wedded to the cult of King Charles the Martyr. 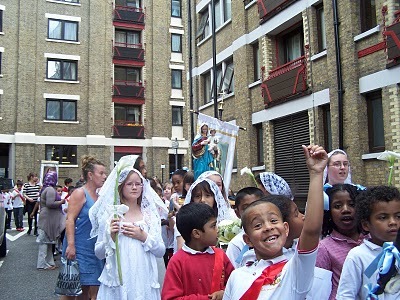 It became apparent that some of this school were Anglo-Catholics mainly because they liked dressing up. Perhaps that kind of degutted Anglo-Catholicism will hang on a bit longer. When I got back to South Africa I became involved with the charismatic renewal movement, so if anyone asked me about my “churchmanship” (as Anglicans sometimes liked to do), I would say “Evangelical Anglo-Catholic Charismatic”, or “Revolutionary Orthodox”, depending on my mood at the time. Hands up and knees down, singing in tongues with incense. But after 1980 the charismatic renewal movement also went into decline. I’ve written about, and am writing about that elsewhere, and will say no more about it here. 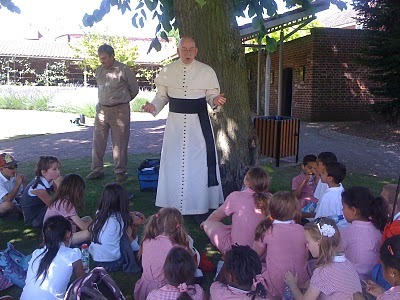 And so to an end, the final picture, Peterite children at Walsingham being taught, its what we did. It’s sad because the children were being taught about a church that will no longer exist when they grow up. There is no longer any room for that kind of Christianity in the Church of England, and it began to die in Johannesburg fifty years ago. They will have been taught that some things were important that no one around them values, and their Christian faith will belong forever to a lost childhood. Twenty-five years ago now I left the Anglican Church, and that picture gripped my imagination as illustrating the main reason for leaving. In 1979 I attended the South African Christian Leadership Assembly (Sacla) in Pretoria, and various Protestant missionary societies had exhibitions in a hall, some of which I remembered from my Evangelical schooldays, and that reawakened my interested in mission and evangelism. In the early 1980s I joined with some others who wanted to form an Anglican Mission Association, and took university courses in missiology. But I also became increasingly uncomfortable about it. If one evangelises, and people come to Christ, then they also come to the Body of Christ, the Church. But it became more and more clear to me that the Anglican Church was not that Church. I would be teaching people things that fewer and fewer Anglicans believed. I would be bringing them into a church that was dissolving around me. more or less in secular terms, like a chain of supermarkets, where the branch managers are called vicars, the regional managers are super-vicars called bishops, and the CEOs are called archbishops. The only difference between bishops and regional managers of a secular business was that bishops wore funny hats. And so I left the Anglican Church and became Orthodox, which in a way gathered all three aspects of my earlier spiritual journey — the evangelical, the Anglo-Catholic and the charismatic — and linked them into something bigger and richer. That is not to say that the Orthodox Church is perfect, and I’m not trying to proselytise among disgruntled Anglicans by saying this. But I can teach people and say “this is the Orthodox Faith”, and they won’t discover that most of the people the meet in the Orthodox Church don’t believe it, and believe something else altogether. Yes, there are plenty who don’t practise it (including me). We may try and fail and fail again to make the world fit the vision, mainly because we ourselves can’t make our own lives fit the vision. But at least we aren’t changing the vision every day. fascinating post, thanks. I knew St Peter’s a little when I was a curate just up the road. Yes, fascinating, and sad. I think that I am still sometimes a little nostalgic for an Anglo-Catholicism that I knew even less than you. Much the same spiritual journey as you Fr. Deacon. Sitting here in England I have sympathy with those (unlike me) who clung on for dear life to the Old Girl. However, I knew (and they must surely have known) 20 years ago that the game was over. The ordinariate provision of Rome will only attract a few … the economic circumstances militate against any kind of exodus. No, these clergy and parishes will just grumpily or in resigned depression fade away. What a betrayal of those early pioneers! What great promise there was in the 30’s of an alignment with Orthodoxy! All gone forever. (When I was an Anglican I was very attached to Mirfield). What can I say, Steve. Tears are welling up for something valuable that is lost. I would add that I believe one of the problems is that the Catholic Church had Vatican II. Anglo-Catholicism did not. As someone brought up in the Australian Irish-Catholic tradition, I am stunned as an adult Anglican by the dress – some of which I never saw in the Roman Catholic tradition. In fact, I meet High Church people who consider themselves Catholic but are a very different species from most of those inhabiting the Catholic Church in Australia these days. I think the dress-up people have disadvantaged the Anglo-Catholic tradition and the social justice people like Huddleston and Melbourne’s Father Tucker have ennobled it. The former too easy to scorn the latter too difficult to live, it would seem. My biggest gripe with regard to the Evangelicals and their ilk in the broader contemporary Christian tradition is their failure to grasp the history of the Christian community in its fullness. They may claim to preach the full gospel but fail to come to grips with the history of the Communion of Saints. Thanks you once again. I am also pleased to have your own personal story all in one piece. Over the years, I have gathered most if not all of your history one way or another but to have it all in a piece and a context has been interesting and very generous of you. I think I have been in communication with you on and off for about a decade – before we were both bloggers – and it has always been interesting. Today, though, has probably been the best. One of my abiding suspicions of Australian Evangelicals is that the Diocese of Sydney backed the Church of England in South Africa when it was at its most right wing. I see you found my blog post which said something relatively similar. As a pentecostal ‘convert’ to Anglicanism it is rather ironic to me that by conviction I’m “anglo-catholic” but I have had very little experience with anglo-catholicism except in their glorious writings. We are quite ‘broad church’ here in MN apart from a particular parish who tends to be rather revisionist so it’s not really where I want to catechize my girls. I appreciate your post here and several others I’ve just read. Peace. Sadly true. Such churches have become exotic and detached from their incarnational roots. As for the Community of the Resurrection, I was shocked, on a visit there last year, to discover that there are only twenty brethren left now, mostly over age sixty, with one novice in his 40s. A former (woman) curate from my parish has joined the staff of the theoloogical college there and many of the students boycott the chapel when it is her turn to say mass. I was invited to serve in the East End by Bishop Trevor & worked under the great priest Norry McCurrie. Although the sort of parish pioneered by Fr Lowder has vanished, much of the spirit of that brand of Anglo-Catholicism lives on in many different ways. We should not be one jot disheartened. To my mind this is what communities up & down our country need & welcome: a church that is for them, incarnational & involved, pioneering the kingdom by sacrificial commitment rather than seeking synthetic conversions. Up here in North London things are different socially from the East End~ my present parish was the one whose members first put forward Margaret Thatcher as a candidate for this constituency ~ but the hunger for the Gospel & the delight in seeing it in action is very much the same. If ideas of the “Big Society” eventually begin to take wing, it will be parishes that embrace the ideals of the old “slum parish” that will be having to shoulder a good deal of the projected work. A friend of mine, or perhaps several friends of mine, at St Chad’s College, Durham, used to speak of Norrie McCurry. I never met him, but he sounded interesting. I am privileged to be related to Norry McCurry. Sadly, I never met him, but through the likes of good people such as yourself I shall know him as I am known. I was reminded of this by reading a book that had Iris Murdoch’s diary of a touring theatre company just before the Second World War, and she mentioned that Norry McCurry was in the audience at one of their performances. I presume he was then a fellow-student. Hi. I read with interest a reference to a Norry McCurry and also Ruth Fryer Matthews, nee McCurry. I am researching the poet Samuel Smyrl McCurry, who resided in Dublin in the early 20th century. He had a son Norman and a daughter Ruth Fryer. Samuel moved to England about 1915. The McCurry family originate from Magheragall, outside Lisburn. Please get in touch with me. Hello Duncan, You and I are related! Samuel Smyrl McCurry’s mother was Margaret and her brother, James, was my 4 x great grandfather. I have a photograph of Samuel and of other of the McCurry family too. Would you be interested to see them? You were surprised at how many men were High Church for the dressing up? What else is there if you find the doctrines superfluous or meaningless except the mincing around in chasubles and incense? Why should these people bother with religion, except it gives them an excuse not to be married at 40 and a not very demanding job with free housing? For those who like dressing up with minimal doctrine, there is always the Liberal Catholic Church. They don’t mind what you believe, as long as you do it with incense. I hope Anglo-Catholicism finally dies one day. They are not Anglicans and their not Catholics either.They’re just nothing. If Anglo-Catholicism dies it will reduce the theological diversity of the Anglican Church which all Anglicans should pray and work for.Anglicans shouldn’t try and mix Anglicanism and Catholicism. It’s like trying to fit a circle into a square hole. Have you tried Western Rite Orthodoxy? I was a full blown Anglo-Catholic ‘spike’ in my younger days. An altar boy, I always asked a visiting priest if he TARPed, etc. I left Anglicanism when the PECUSA ‘ordained’ women. After Orthodoxy, tho’, my journey ended in Rome, where I am quite comfortable as an Eastern Rite Catholic. Well – you got that one wrong… It’s 2015 and the Anglo-Catholic movement is still going strong and getting stronger. Some advice. It’s not a good idea to rubbish where you came from because you think where you are is better. Where is Anglo-catholicism strong?, because it is definitely not here in South Africa. I’m surprised at the offence people took at this post because it seems like an observation to me. I consider myself Anglo Catholic, and believe me there is no place anymore for my kind within the Anglican Church of Southern Africa. I think that the Anglican Church in Southern Africa is sufficiently clericalist (not saying that others aren’t) that the parish tends to follow the example of its priest, and bishops tend to dislike “extremism”, so when an “extreme” priest leaves a parish, the bishop is likely to send a more “moderate” one as a replacement, and so everything tends to get watered down. Our parish seems to be facing exactly that fate Fr. Our priest is due to retire in June but will ask the Bishop for an extension. I am not confident that this will succeed as the bishop we now have looks nothing like our parish, which is traditional.